This figure appears in our 2016 JMS paper and describes the clogging behavior of NPN with a 37 nm average pore size. The y-axis is the volume of filtrate after 1 min of forward centrifugation at 690g (3000 RPM). The x-axis is particle concentration in #/ml. The particles are polystyrene. Note we chose a size too large to fit through the membrane (100 nm) and particles (and protein) much smaller than the pores. Larger particles clog at much lower concentrations than small particles but the paper concludes that cake formation is the primary mechanism for clogging. The figure gives sound advice for the concentrations at which to use our membranes in this mode of filtration. Stock polystyrene (PS) concentrations in this figure are the far right data points of the 100 nm and 20 nm curves. So one needs to dilute PS NPs to work with them in dead end filtration. Gold is orders of magnitude less concentrated which is one reason it makes for a much better NP sample in our studies (the basis of all of our sieving curves for example). The protein concentration ranges from 0.5 mg/ml to 5 mg/ml. 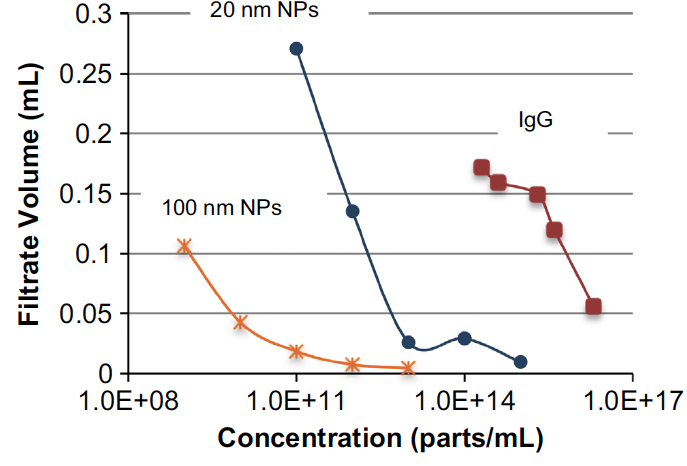 Lately I’ve been thinking about this figure with respect to nanoparticle (also virus, exosome) capture in a centrifuge. In this application we are interested in generating a clogging event but the clogging mechanism should be pore blocking (i.e. filling the pore as a plug). Interestingly, we didn’t see this mechanism in the JMS paper but it seems it would require a careful tuning of particle size and concentration. The particles should be around 40 – 50 nm to be captured inside tapered pores and the concentration should be tuned to the match the number of pores. With roughly 10 x 10^10 pores/cm^2 and a 0.036 cm^2 for our newest (4 slot SepCon) membranes, we can theoretically capture 3.6 billion particles. Lets say we start with a 200 ul sample and spin 100 ul through the membrane, the sample could theoretically be as concentration as 3.6 x 10^10 /ml NPs to reach saturation. Dropping to 10% of this number seems safer, so 3.6 x 10^9 /ml. Interpolating from the figure above to an imaginary 40 nm particle at this concentration, we should expect a pretty good flow rate (100 ul/min) for a quick capture process.